Think jack-o’-lanterns are frightening? Try being a man in Ukraine. Then you’ll truly understand what it’s like to fear a pumpkin. For centuries in the Eastern European nation, a pumpkin meant one thing: No, I won’t marry you. An old tradition held that a would-be suitor would visit a woman’s house to propose. If the answer was yes, there was family toasting and celebration. If no, the poor guy was silently handed a pumpkin…. Poor guys! 🙂 Read the rest from NPR here. Pink and Green Mama has more on how to make these fun beasties! And mammoth! Don’t forget mammoth! If you’re curious about this atlatl thingee that I’m always posting about, this article has some good basic information about it. These printable dice sound like fabulous fun! Visit Made in Me to print yours. See kids, grammar matters! Because we all have a right to vote for persons with mental illnesses, right? Oops… Read more about the poor wording that’s causing voter confusion here. The mission is to boldly go where no man has gone before – on a flight to Mars. The snag is that you’d never come back. 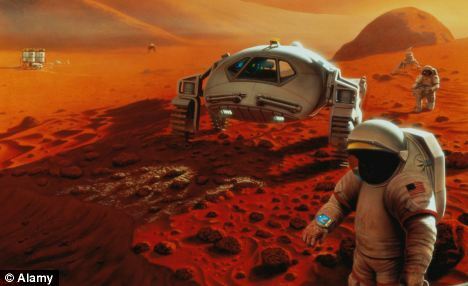 The U.S. space agency Nasa is actively investigating the possibility of humans colonising other worlds such as the Red Planet in an ambitious project named the Hundred Years Starship. Wow! Amazing stuff to ponder. Read the full story here. This entry was posted in crafts, Fun, Grammar, Preschool, science, social studies by Alicia. Bookmark the permalink.